Dan Wheldon was one of a golden crop of richly-talented British drivers to graduate from karting to junior single-seaters in the mid to late-1990s. From Emberton, near Milton Keynes, Daniel Wheldon began karting as a small child, taking his first steps in a sport that was a family passion: his dad raced karts as an amateur, and his mum was timekeeper at the local track. At the age of 12, in 1990, he claimed his third successive British Cadet Karting Championship. He then moved up to claim a British Junior title, before becoming FIA Formula A World Cup champion in '95 with the team of karting legend Terry Fullerton. With Button claiming Ford glory and all the headlines, Wheldon had insufficient family backing to move further up the ranks in Europe. He therefore set his sights on the USA for 1999, making his first move to a country he would grow to love. The new boy from the 'old world' claimed the US Formula Ford 2000 title at the first attempt, and in successive seasons rose the CART ladder by claiming second in the Toyota Atlantic and then Indy Lights championships. He pushed for a move into the CART World Series, but no opening came, and instead it was the IndyCar Series where he got his chance, joining Panther Racing for a pair of late-season outings in 2002. In '03, when Dario Franchitti's motorcycle crash forced him out of the cockpit, Wheldon was called up by Andretti Green Racing to stand in for the Scot. When Franchitti recovered, Wheldon was retained because team boss Michael Andretti had stood down from driving after the Indy 500. Wheldon's reputation rapidly grew, and he showed an affinity with ovals few would have expected a European with a road-track grounding to have. In 2004 he took his first win at Motegi, and the following season he blitzed his way to the IndyCar title and victory in the Indy 500 – the first Englishman to win the race since Graham Hill in 1966. Incredibly, Wheldon would not defend his title with Andretti Green. Instead, he switched to Chip Ganassi Racing. The partnership started perfectly with a victory for Wheldon, in Ganassi's Grand-Am Daytona Prototype, in the Daytona 24 Hours. And the IndyCar season was pretty good too, Wheldon only being beaten to the title by Sam Hornish Jr – his first-ever IndyCar team-mate back in 2002 – on a countback of race wins. Wheldon took fourth in the championship with Ganassi in 2007 and '08, winning two races in each season to take his IndyCar career tally to 15, but his form had dipped and he was released by the team at the end of the season in favour of Franchitti, who made a switch back to IndyCar following his unsuccessful NASCAR stint. The following season featured a return to his roots at Panther Racing. Although he was now well and truly with one of the 'little teams', Wheldon scored some good results and placed in the top 10 in points in 2009 and '10. With no sponsorship forthcoming for Wheldon for '11, he was dropped by the team, but after the resolution of a lawsuit there was talk of his rejoining the squad. Instead, he set his sights on Indy 500 glory with the team of his friend, Bryan Herta, with whom he had lined up in his Andretti Green days. On May 29 this year, Wheldon took an emotional second win in the 500 in his Bryan Herta Autosport Dallara, ironically thanks to Panther Racing's JR Hildebrand drifting into the wall at the exit of the final corner of the race. He was also named as official development driver for the new-generation Dallara IndyCar, with Herta's team running the programme. After IndyCar Series boss Randy Bernard failed to raise any takers from the world of international motorsport for his lucrative challenge in this year's Las Vegas finale, Wheldon was chosen to race for $5 million, which would be split with a fan if he won the event. He contested the Kentucky Speedway race two weeks ago with Sam Schmidt Motorsports as a warm-up, and was regarded as a realistic threat for victory in Vegas. Then came disaster. 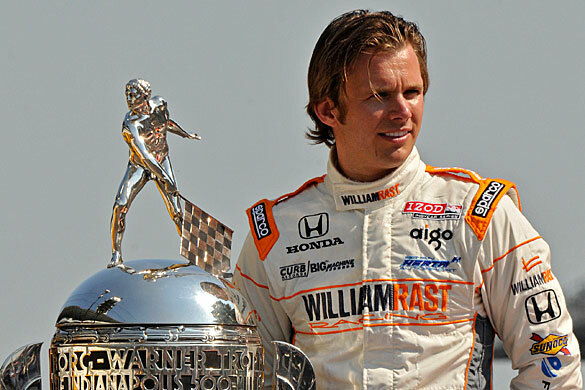 Dan Wheldon was a man who embodied the ideal of the immigrant to the 'New World' fulfilling the American Dream. Out of all the British – and indeed European – drivers to have made their careers in the US, Wheldon seemed to most fully embrace the American lifestyle, adopting a Transatlantic twang to his accent remarkably early, and donating his winnings from the 2008 Iowa race to victims of the region's recent tornado. Perhaps his affinity with the country was one reason why he turned down an offer from BMW Sauber to join its Formula 1 team for 2006 as third driver, as understudy to Jacques Villeneuve and Nick Heidfeld. As the reigning Indy 500 and IndyCar champion, why leave behind what he regarded as the perfect lifestyle? He married his personal assistant, Susie, in 2008, and together they had two sons, Sebastian (born 2009) and Oliver (born March this year). It is with his family, and his many friends in the world of motorsport, that our thoughts lie at this desperately sad time.